Maine Mortgage Calculator - estimate your new house payment accurately! Getting an accurate estimate on a mortgage payment in Maine can be difficult. Sites like Zillow show you best case scenarios by assuming you have perfect credit and are putting 20% down (and therefore don’t quote you Mortgage Insurance). Other mortgage payment calculators don’t go into depth or enough detail to be accurate, so with that in mind we’ve provided you with some industry-insight into what it takes to accurately calculate a payment. 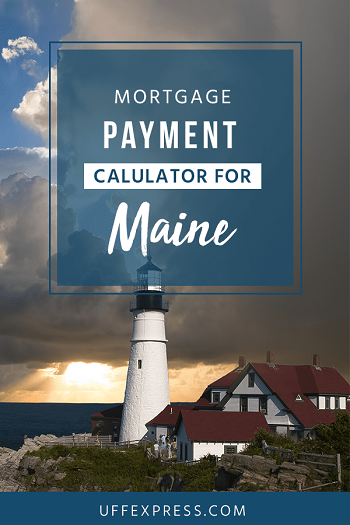 Specifically, since Maine is one of the states we lend in the most, we wanted to create a Mortgage Payment Calculator for our Maine clients. With our fellow Mainers in mind, we've also written a specific article for First-Time Home Buyers and FHA Loans in Maine. Mortgage payments vary state-by-state, but for the most part they’re similar. The primary difference is in property taxes and in the state of Maine, county property taxes on homes are high compared to the national average. Follow our tips below and you’ll be able to accurately calculate how much a mortgage payment will be. This is a great first step and tool to get an initial idea of what your price range should be when buying a house in Maine. DID YOU KNOW? A mortgage payment in Maine is typically comprised of 4 components: the loan payment (P&I or principal and interest), Property Taxes, Homeowner’s Insurance (HOI) and Mortgage Insurance (PMI). Loan amount – this is how much you will borrower (after your down payment). If you’re unsure about down payment requirements or mortgage options, check out our detailed home loans guide. Property value – purchase price of the home or what you think it’ll appraise for if you’re doing a refinance. Interest rate – rates vary based on loan program and can be dependent on credit score. Give one of our licensed loan advisors a call and we can provide you some quotes and personal options. As of today, rates range anywhere from 4.375%-5.500% on a 30-year fixed in most instances, but will vary based on loan program, credit score, term, down payment and discount points. Loan term – the longest and most common mortgage term is 30 years, but there are options for 25, 20, 15 and 10. The term itself is the most important factor in your payment amount and how much you’ll pay over the life of the loan. Property tax – the county in Maine that your home (or future home) is in will assess the value of the home and determine the property tax amount. Therefore, the amount of tax will vary with each home. For Property Tax estimates in your specific county, see the list below the calculator. We’ve taken the time to estimate the property tax percentages for each county throughout Maine. Property Insurance (Homeowner’s Insurance) – if you have good credit and buying a newer home use .45% of your loan amount for a decent estimate. Use .55% if you’re buying an older home or have fair/poor credit (low-to-mid 600’s). Conventional loan use .96% (if 5% down), .65% (if 10% down or qualifying first-time buyer with 3% down), or .28% (if 15% down). Use 0% if putting 20% down. While using a payment calculator to estimate your mortgage is a great first step, once you’re ready to see if you qualify then apply online or give one of our trusted experts a call to help guide you through the process. Note: in the state of Maine, they do offer qualified homeowners a discount on property taxes through their Homestead Exemption. Once you’ve lived in your home for 12 months you become eligible and should apply for the exemption through your county.